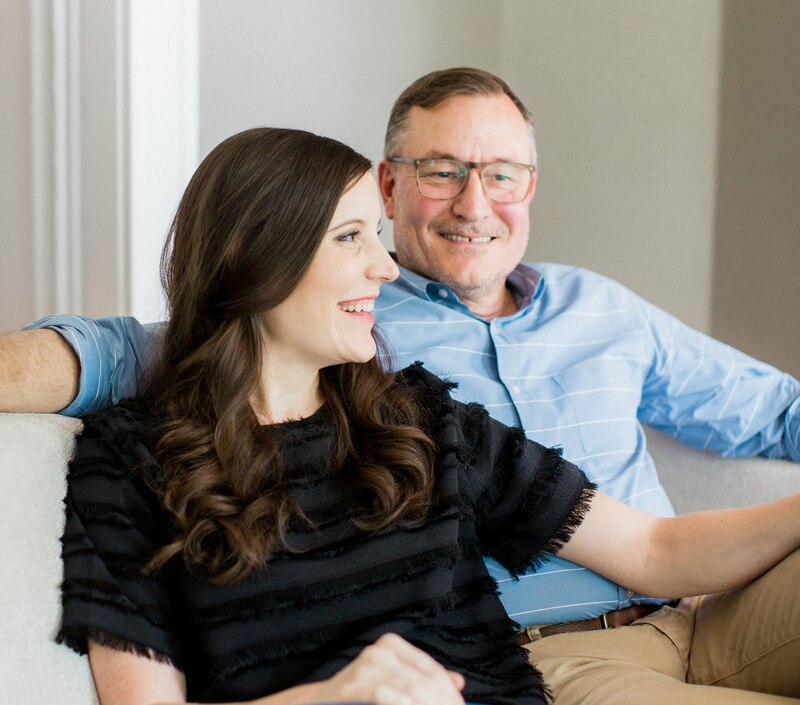 I don't know about you, but we've been seeing a few 100 degree days during this Richmond summer — you could call them the "dog days." Speaking of dogs, let's talk about cool summer treats you can whip up at home to help your favorite four-legged friend beat the heat. Basil is a big fan of cold and frozen treats, he loves to chew ice cubes after hot walks and you'll often find him prancing over to the fridge whenever we pop a glass under the dispenser. Since he's such a fan of plain old ice, we figured we'd have a little fun coming up with some more flavorful versions, that have a softer frozen consistency especially for him. 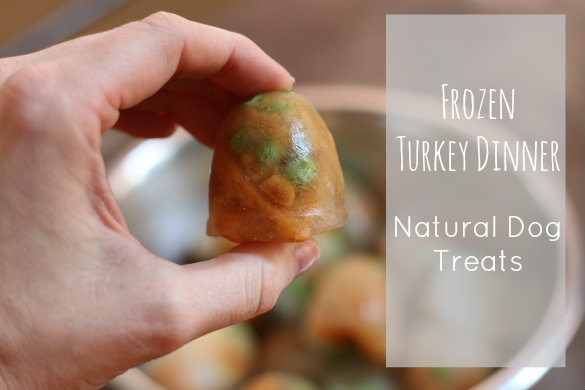 We ended up making these frozen turkey dinner treats using completely natural ingredients we had as leftovers and can't wait to share the recipe with you. Please Note: as with all treats, it's best to let your pups enjoy while under your supervision. Different dogs react differently to ingredients, so keep a running list of your pup's allergies, avoiding those ingredients when making homemade treats. Similarly, dogs tolerate hot and cold treat temperatures differently, you know your dog best. Please feel free to interpret these ingredients loosely — they are super simple to swap and substitute. 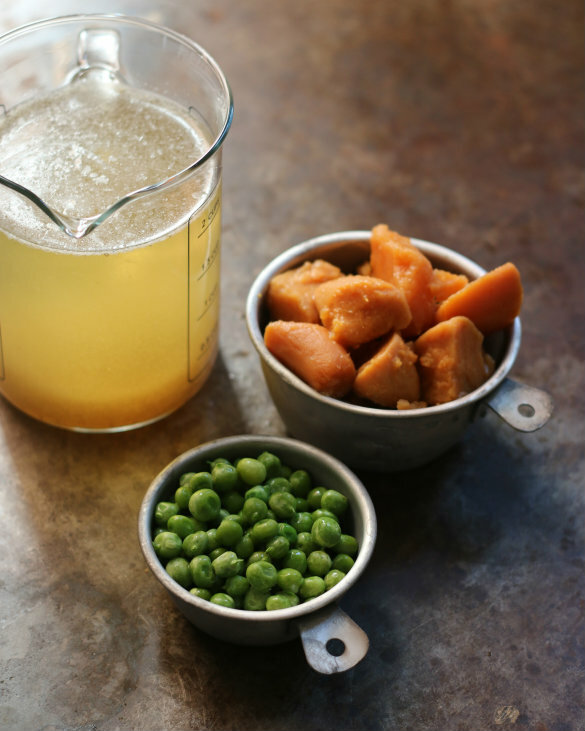 We opted for organic fresh peas and sweet potato, and the turkey broth came directly from our own running homemade supply (it's so simple to make and helps get rid of leftovers). That being said, frozen peas, canned broth and potatoes would do just as nicely. 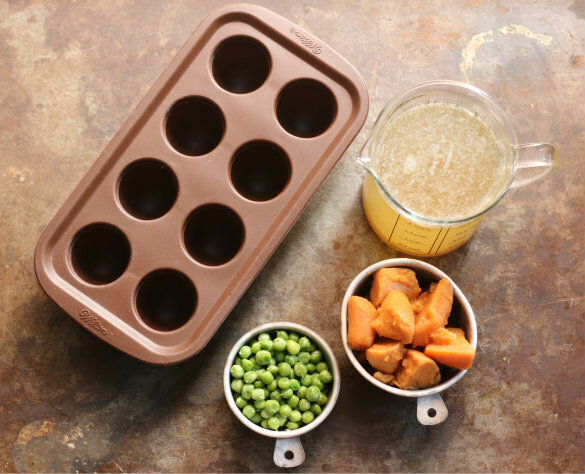 You could mash the potatoes and peas or completely swap in the different dog-friendly vegetables you have on hand (carrots, squash and green beans are all healthy options). 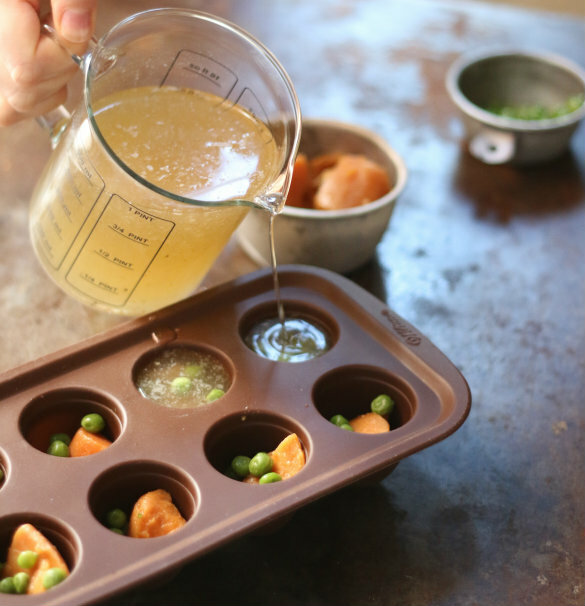 When it comes to the broth, turkey, chicken, beef and vegetable varieties will all work — and while the broth adds that nice extra flavor and softer frozen consistency for your pooch, water would also work as a substitute. Basically, it's all about what's easiest for you to toss in, because your pup is going to love these! 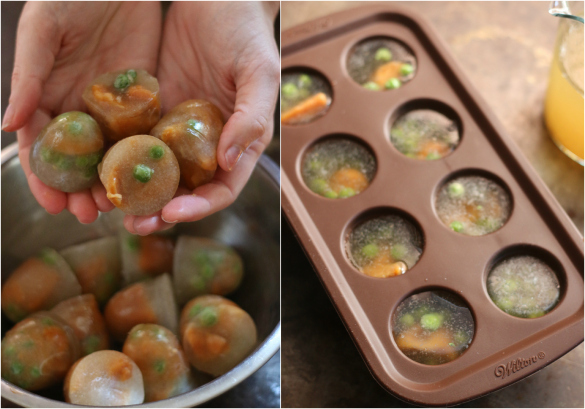 We actually used a silicone cake pop mold for these treats, since we like to give Basil more substantial goodies sometimes, but let's face it, you could use any kind of ice tray or mold you have on hand. 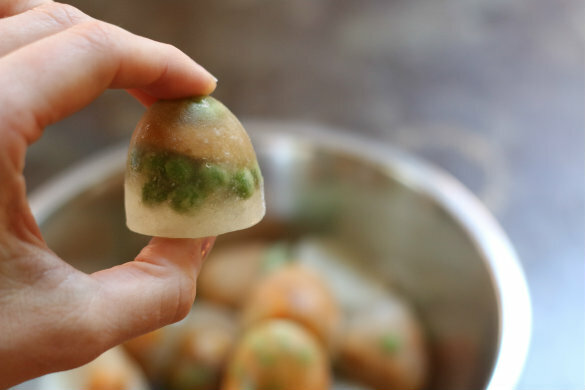 If you wanted to take these up even to the next level, you could make them in a muffin pan for jumbo sized treats. 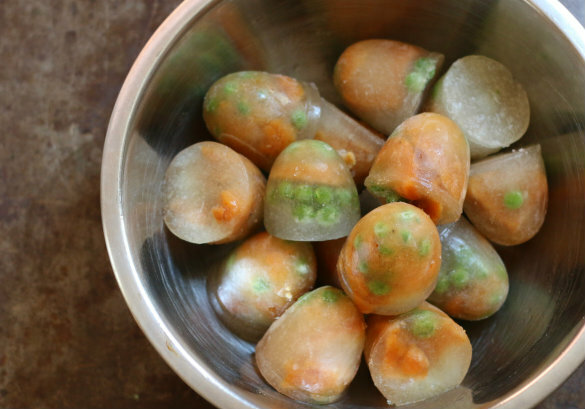 Pop those suckers in the freezer for at least 4 hours or overnight, then you're good to go. I told you these were simple! Seal in a plastic freezer bag for easy storing and grabbing from the freezer as needed. And now for the most important question — how does Basil like them? Well, initially we got a little "pace and whine" before settling down to break in and enjoy — this behavior is only reserved for special treats like beef bones or a new antler, so you could call them a huge success! We like that they take him a little while to work through (Basil's usually a food and treat vacuum), and each time a pea loosens from the ice it's like a whole new little surprise he wasn't expecting. 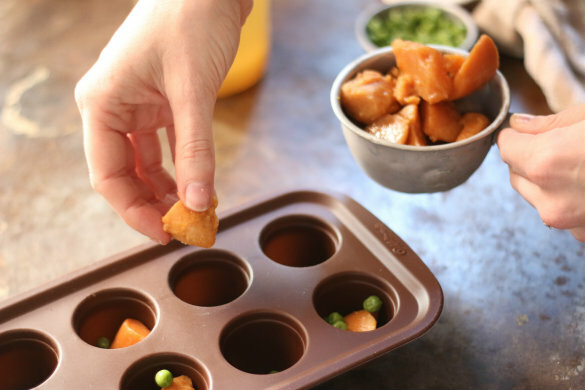 These turkey dinner treats have been a big hit in our house, so it will be fun trying out new variations with dog-friendly ingredients throughout the summer. That's a 'pawsome' way to treat a pooch in the summer! Will be making some of these for Sam. "Pawesome" Ha, that gave us a chuckle and we are sure Sam will like! 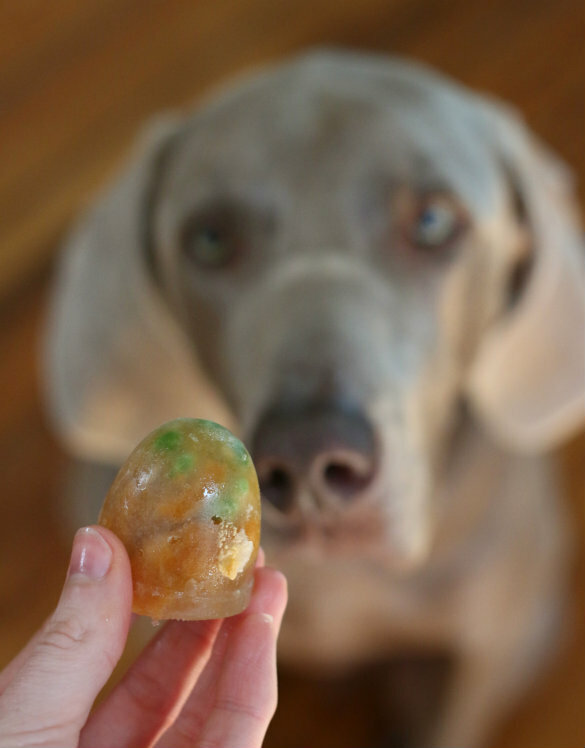 Look tasty to dog and your steps of making these frozen turkey dinner treats are so simple, now I can't wait to do it for my dog by following your recipe. Lastly, thanks for sharing this great cooking guide! You're so welcome, thanks for checking in!